Homeschool students and their families are invited to a special program day at the Dossin Great Lakes Museum on Belle Isle! 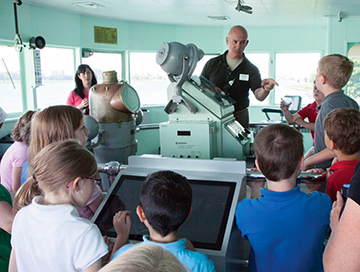 Students will explore the geographic, economic, social and cultural developments of the Detroit River and the Great Lakes waterways through a series of 30-minute hands-on workshops. Families can choose which workshops they will attend and record their participation on a Field Day Scorecard. Participating in how to tie nautical knots. Handling and interacting with items from the 18th century fur trade. Identifying maritime flags and decoding a secret message. Exploring Great Lakes freighters and the cargo they transport. The cost is $5 per person (students and adults). Register now! Call our group sales associate at 313.833.7979 or email heatherd@detroithistorical.org.